No.1 shop of Twosome Coffee in Shanghai, ‘Shanghai Nambangsangchung Shop’ is located at the first floor of a complex shopping mall, Biren Nambangchung’ where large apartment houses are densely located in southern area of Shanghai. 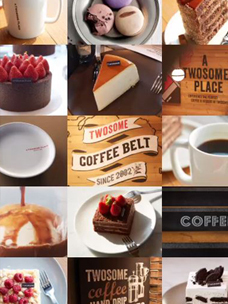 Moreover, global brands such as McDonald, Starbucks, Haagendazs and Pizzahut are located same floor and as there are many floating population there primarily from middle and high classes, this area is a suitable location to enhance brand power of Twosome Coffee within Shanghai. Its space is approximately 55 Pyeong and will serve Twosome’s special coffee with specialized blending and roasting, cake, waffle and other high quality desserts. ?“CJ Foodville, with this Twosome coffee’s entering Shanghai market, came to run 140 shops or so from a total 4 brands at 10 countries including Tous Les Jours, Bibigo, VIPS and Twosome coffee” and “We will not only accelerate enlargement of China market for Twosome Coffee but also nourish it as a global brand by attempting to enter other countries actively like Tous Les Jours or Bibigo” said A person in CJ Foodville. Currently, CJ Foodville runs 140 shops or so at 10 countries including USA, U.K, China, Japan and Vietnam and other East Asian countries.